Is there a way to Hide the status panel from the Client's view? I think it's great I can see that information as the HOST, i'm not sure my clients need to see it. Just having the messages window pop up when they click the tray icon and nothing else is what i'm after. Is this possible? I was only able to find the StatusPanel label's in advanced configuration. Download the [Edit App.Config Settings] extension and click Options > Edit App.Config Settings. The App.Config Editor should launch. 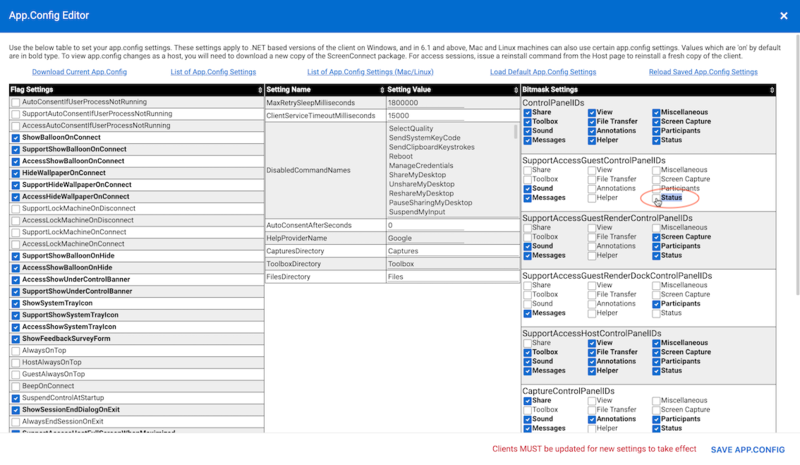 Untick the Status checkbox under the heading [SupportAccessGuestControlPanelIDs].